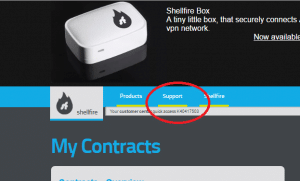 Shellfire VPN Review 2019 – Is The Shellfire Box Secure? Mandee Rose | Posted on February 20, 2018 February 12, 2019 | Leave a comment on Shellfire VPN Review 2019 – Is The Shellfire Box Secure? It is important to be wary of free VPN services. Tricksters and even government security agencies have been known to put up fake VPN services to attract the unsuspecting public. In the case of hackers, they use these free VPN services to create nodes in their “botnet,” which is a host of private computers that can be commanded to make superfluous connections to servers as part of an attack. Consumers can be assured that Shellfire VPN is not in this division. The free software is available from a number of third-party sites, which have their reputations to uphold and check the program package before they host it. Softpedia guarantees that the Shellfire client is 100% clean of malware. How Much Does Shellfire VPN Cost? 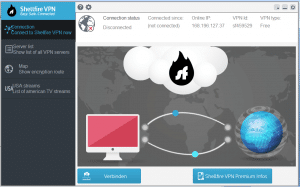 Shellfire VPN offers three levels of service. The lowest cost is no cost – absolutely free. With either of the two paid plans, you get improved service. Beware, many VPN aficionados recommend a minimum of 256-bit encryption, which you only get with the PremiumPlus package. However, many VPN companies offer 128-bit encryption for mobile devices. This is because consumers discovered that the full 256-bit encryption drains the battery when implemented on smartphones. The free service has other restrictions. The publicity says that you only get a speed of 1 Mb per second. However, in the application it states that the free servers only allow UP TO 768 kb per second. You only have access to servers in the USA and Germany. That means that it wouldn’t get you into BBC iPlayer. You get a choice of servers in 20 countries with the cheaper of the two paid packages, but that plan still doesn’t offer the full 256-bit encryption. With both of the paid versions you get a discount if you choose to pay for a whole year rather than paying month by month. Be careful and check your bank account, because Shellfire VPN will set up a recurring payment demand. That means you need to cancel the repeat payment setup at your bank as soon as you complete the purchase, otherwise you might be surprised when the next payment gets taken out of your bank at the end of your first subscription period. Shellfire VPN accepts Paypal, credit and debit cards, and bitcoin. Unusually, you can also pay by direct debit or bank transfer. What Do I With Shellfire Get? The free version imposes a wait time of 25 seconds before it makes each connection. After that, though, there is no time limit on usage. There also isn’t a limit on the amount of data that the VPN will process each month (whereas most bona fide free VPNs have a data limit). You only get the option of the OpenVPN protocol implementation with the free service. However, that is the most widely-used system for VPN services. The company keeps no activity logs beyond temporary records needed for procedural operations. It is based in Germany, which has strict privacy laws that favor internet secrecy. Although the country requires internet service providers to keep records, Shellfire is not one of those. Thus it is not obliged by law to record customer activity. So it doesn’t. 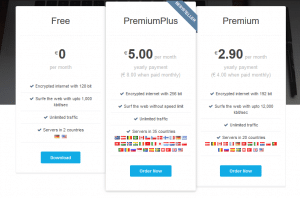 The actual software is the same for all of the three service levels that Shellfire VPN offers. Therefore, it is better to try the free service before committing to a subscription. You don’t have to give any personal information to get the software. However, you will need an account to get the client to work. The only information you have to enter is an email address. You must confirm the email address before getting the software, so it has to be a real one. However, you can set up an anonymous email account with a webmail service, and so get the VPN onto your computer and running without giving any personal details at all. Click on one of the Download buttons that appear all over the site to get to the initial download screen. Android users need to follow the link to Google Play; iOS smartphone owners need to go to the Apple App Store. The download file for Windows has a size of 21.9 MB. Once the installation file finishes downloading, click on it to get the Install Wizard to open. 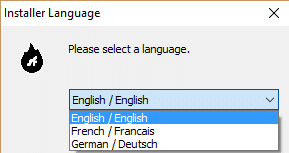 Choose your language in the first pop-up. This allows the installation process to start. Accept the licence agreement in the next screen and click through on the Next button. The installer won’t sneak any unwanted extras onto your computer. The app requires supporting Java libraries. If you don’t already have those on your computer, the installer will download them. This process takes a long time to complete and you might think that the program has frozen. However, once the Java installation completes, the Shellfire installation proceeds quickly. Click on the Finish button in the last screen to open the app. 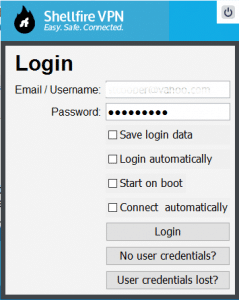 After running an initial check on the connection, the software will warn you to organize your login details. Of course, you won’t have these yet. Another pop-up asks you whether you want the VPN to start running when your computer starts up. Answer Yes or No to get to the app. The app detects that this is your first time with the software and offers to set up an account. Click on “Yes” to get the registration pop-up – you do not have to go back to the webpage. 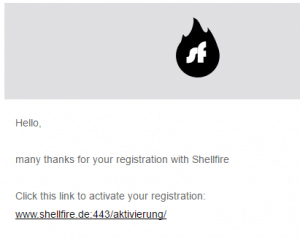 Check your Inbox for an activation email from Shellfire. Click on the link in the email. This opens a webpage in your default browser and you will see a pop-up message confirming that your account has been created. When you get to the app after the registration process has completed, you will see that your login credentials have been filled in for you. Click on the login button to proceed. Those two colored blobs on the connecting arcs in the illustration spin round and round, making you think that the connection is taking place. However, you will be sitting there all night, because this is actually just a moving picture. It doesn’t depict any actual activity. You need to click on the Connection button to get the VPN to start. You might think that the “Connection” sign at the top of the left-hand menu is it, but it isn’t. In fact, you need to press the “Verbinden” button. With the free version, an overlay pops up. The annoying thing about this is that it doesn’t just overlay the app, but everything on your computer and it won’t go away until it has finished counting down from 25 seconds. After that, the connection will proceed. Once you are connected, the Verbinden button changes its name to Disconnect. You can choose which server you connect to by clicking on the Server List in the left-hand menu. However, the list is grayed out while you are connected. Press the Connection button at the top of the menu to return to the main screen and then click on Disconnect. You can now return to the server list to change the location of your fake Internet Protocol (IP) address. As you can see in the list, very few of the servers get up to the 12,000kb per second offered by the Premium package. Customer support is available back at the company website or by email. You need to go back to the Shellfire VPN homepage and click on Login at the top of the window. You then need to click on the Support tab. 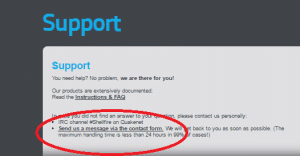 Click on the Contact link in the support screen to leave a message for the support team. An operative will send an email to your registered address. The free service has a limited speed, but many report that it is fast enough to watch streaming video – even Netflix – so you may not need to shell out any cash to get full enjoyment from the service. With the US proxy server engaged, the Speedtest.net server switched from delivering me the Beta version to the older version that uses less bandwidth. It must have detected that my connection had restricted speed. The results of connecting to a server just down the road show that the download speed had been reduced to just below 1 Mbps. This shows that the advertised speed of the free VPN service was correct, and the Server List record that the connection was limited to 768 kb per second was exceeded. 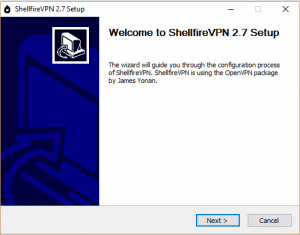 With this connection, Shellfire VPN actually exceeded its declared limits on the free version of the service. However, this is still worse performance than was achieved by connecting to London without a VPN. Had I wanted to access BBC iPlayer, this connection would not have helped me, because my official IP address is in the United States, and geo-location restrictions on the video server only allow connections from British IP addresses. Upload speeds were a little better, but download speeds were slightly worse. If you click on the overlay that appears when you click on the Verbinden (Connect) button, your default browser will open with the Shellfire VPN homepage in it. You won’t be taken to the order page, so you need to click on the “Order Premium” button. 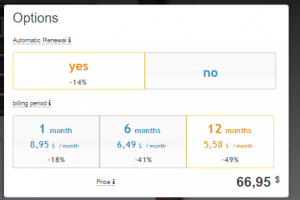 This will take you to the pricing page. You can choose between the Premium package or the PremiumPlus option to upgrade. In the following order page, be very careful about your intentions. If you want complete anonymity, then pay with bitcoin and use a fake name. The payment screen doesn’t ask for your email address because you are already logged into your Shellfire VPN account and it has that information on file. Once you complete your transaction, you will receive an email confirming your new plan. Your new service will be activated instantly. If you pay with bitcoin, it can take 15 minutes before your better service kicks in. If you choose to pay by direct debit or bank transfer, you might not see your new status for three days. Should I Subscribe to Shellfire VPN? 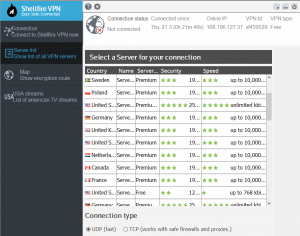 Shellfire VPN is a mid-range service. There are paid services out there that have many more server locations, but they are a lot more expensive. The 25 second overlay for the free service is annoying, but you have to expect some inconvenience if you are getting something for nothing. The company could do better. 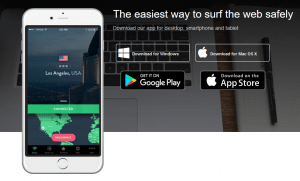 The creators of Shellfire VPN must have explored their future rivals at the beginning of their mission to provide a VPN service. They must have seen that companies that are cheaper and/or better allow five or six simultaneous connections to their subscribers. It is difficult to understand why the company doesn’t fully compete with the other services out in the marketplace. The Connect/Disconnect button is not very responsive, which means that you doubt whether clicking on it really worked. This results in repeated clicks, which can end up disconnecting you and then reconnecting you again needlessly.